Clyne heads the market in the 13:50 Betfair Exchange Handicap Hurdle, and while soft ground hasn’t proven to be a problem for him, it won’t be easy carrying top-weight in these conditions. Limited Reserve’s second to Elgin at Ascot earlier in the month received a huge boost after the latter went on to win the Greatwood and he’s shown a decent level of soft ground form so would be well worth taking into consideration at 6/1. I also like the look of Fergal O’Brien’s Diamond Fort who was an impressive winner last time, beating a subsequent winner by 3+ lengths; he’s available at 10/1 on the Betfair Sportsbook. Sefton Novices’ Hurdle winner – The Worlds End – makes his seasonal re-appearance in the Betfair Stayers’ Handicap Hurdle at 14:25 however the last horse to win off a mark as high as his was Diamond Harry in 2009. Since then, save for last year’s renewal, winners of this race have tended to be much more lightly campaigned. It’s a hugely competitive field but No Hassle Hoff gets some weight from the fav and could reverse the beating he received from him at Doncaster at the turn of the year. He’ll enjoy the ground and can go well for Dan Skelton at 6/1. The Dutchman is an intriguing runner for Colin Tizzard, having switched from Sandy Thomson’s yard but I would prefer him to have had a run under his belt before this. It’s also worth keeping an eye on the market for Le Rocher, there’s been a bit of money about for him this week and he has excellent course form for a trainer/jockey combination that took this contest in 2014. Given the withdrawal of Sizing John, Bristol De Mai looks almost certain to go off favourite for the Betfair Chase at 15:00; he was a good winner of the Charlie Hall – and tipped up in this column – but this is a fair step up in class for him, even without the Gold Cup winner. 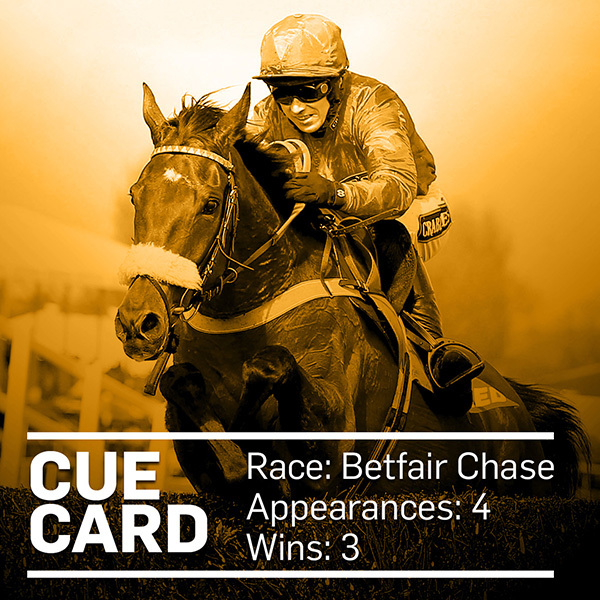 There likely won’t be a dry eye on course if Cue Card is to roll back the years and repeat his 15 length victory of last year. But I’m struggling to envisage him emulating Kauto Star and winning at the grand age of 11, especially given the fact he’s fallen in two of his last three starts. Of the rest of the field, Outlander has race fitness on his side and rallied well to win at Down Royal last time out. He may throw in a rogue run on occasion but he’ll be suited by the conditions of this race and Jack Kennedy seems to get on well with him (two wins from three rides including the Lexus Chase last year). Odds of 9/2 underestimate this multiple Grade 1 winner and he makes plenty of appeal for the Gordon Elliott yard. Smad Place very much deserves his place at the forefront of the betting for the 1965 Chase at 14:05, his performance in the Old Roan last time showed that the fire does indeed still burn. He tends to go well fresh though and hasn’t put together back to back wins since winning the Hennessy in 2015 so it may be worth looking elsewhere. Nicky Henderson’s Top Notch is also in at 5/2 and I’d be much keener on his chances. He’s unbeaten at Ascot and can be forgiven a lacklustre performance in his comeback run in what was a muddling three runner contest over hurdles. The Coral Hurdle at 14:40 may finally afford us the opportunity to get a glimpse of the unbeaten Defi Du Seuil on a racecourse again after being pulled out of the Greatwood last week. He’s currently 4/5 and it’s very hard to imagine him being beaten on Saturday with Lil Rockerfeller looking the most likely to follow him home. Sire De Grugy returns to defend his crown in the 2m1f chase at 15:15 but at the age of 11, this will take a lot more winning off a 5lb higher mark. Exitas was a striking winner at this course earlier in the month and subsequently finished third at Cheltenham last week; if turned out again quickly he could make his presence felt at 10/1. The one that really takes the eye comes from a Venetia Williams yard that’s no stranger to an Ascot Handicap coup and she may have a live one in the shape of Gardefort. He’s been well found in the market at 5/1 but his claims are obvious based on his second in last year’s Grand Annual and a hugely promising comeback run at Aintree. The trainer is having an excellent November – as she usually does – operating at a 25% strike rate over the last fortnight and I expect Gardefort to add to that on Saturday. Don’t forget that for every SP 3/1+ winner you back on live ITV races on the Betfair Sportsbook, you get a free bet to the same value (Max £25).